The violence and cruelty of Arabs often perplexes Westerners. Not only does the leader of Hizbullah proclaim "We love death," but so too does, for example, a 24-year-old man who last month yelled "We love death more than you love life" as he crashed his car on the Bronx-Whitestone Bridge in New York City. As two parents in St. Louis honor-killed their teenage daughter with thirteen stabs of a butcher's knife, the Palestinian father shouted "Die! Die quickly! Die quickly! . . . Quiet, little one! Die, my daughter, die!" – and the local Arab community supported them against murder charges. A prince from Abu Dhabi recently tortured a grain dealer whom he accused of fraud; despite a video of the atrocity appearing on television internationally, the prince was acquitted while his accusers were convicted. Smith takes as his prooftext Osama bin Laden's comment in 2001, "When people see a strong horse and a weak horse, by nature, they will like the strong horse." What Smith calls the strong-horse principle contains two banal elements: Seize power and then maintain it. This principle predominates because Arab public life has "no mechanism for peaceful transitions of authority or power sharing, and therefore [it] sees political conﬂict as a ﬁght to the death between strong horses." 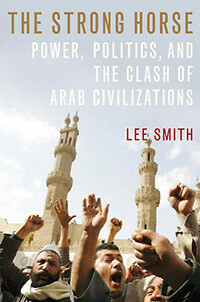 Violence, Smith observes is "central to the politics, society, and culture of the Arabic-speaking Middle East." It also, more subtly, implies keeping a wary eye on the next strong horse, triangulating, and hedging bets. Smith argues that the strong horse principle, not Western imperialism or Zionism, "has determined the fundamental character of the Arabic-speaking Middle East." The Islamic religion itself both fits into the ancient pattern of strong-horse assertiveness and then promulgates it. Muhammad, the Islamic prophet, was a strongman as well as a religious figure. Sunni Muslims have ruled over the centuries "by violence, repression, and coercion." Ibn Khaldun's famous theory of history amounts to a cycle of violence in which strong horses replace weak ones. The humiliation of dhimmis daily reminds non-Muslims who rules. Smith's prism offers insights into modern Middle East history. He presents Pan-Arab nationalism as an effort to transform the mini-horses of the national states into a single super-horse and Islamism as an effort to make Muslims again powerful. Israel serves as "a proxy strong horse" for both the United States and for the Saudi-Egyptian bloc in the latter's cold war rivalry with Iran's bloc. In a strong-horse environment, militias appeal more than do elections. Lacking a strong horse, Arab liberals make little headway. The United States being the most powerful non-Arab and non-Muslim state makes anti-Americanism both inevitable and endemic. 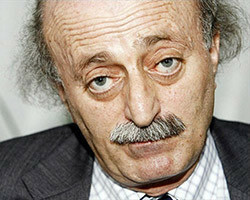 Lebanese Druze leader Walid Jumblatt suggests American car bombings in Damascus. Which brings us to policies by non-Arab actors: unless they are forceful and show true staying power, Smith stresses, they lose. Being nice – say, withdrawing unilaterally from southern Lebanon and Gaza – leads to inevitable failure. The George W. Bush administration rightly initiated a democratization project, raising high hopes, but then betrayed Arab liberals by not carrying through. In Iraq, the administration ignored advice to install a democratically-minded strongman. More broadly, when the U.S. government flinches, others (e.g., the Iranian leadership) have an opportunity to "force their own order on the region." Walid Jumblatt, a Lebanese leader, has half-seriously suggested that Washington "send car bombs to Damascus" to get its message across and signal its understanding of Arab ways. Smith's simple and near-universal principle provides a tool to comprehend the Arabs' cult of death, honor killings, terrorist attacks, despotism, warfare, and much else. He acknowledges that the strong-horse principle may strike Westerners as ineffably crude, but he correctly insists on its being a cold reality that outsiders must recognize, take into account, and respond to. sent an emissary with a message from Caliph Abu Bakr to the Persian commander, Khosru. The message stated: "You should convert to Islam, and then you will be safe, for if you don't, you should know that I have come to you with an army of men that love death, as you love life." Stalinksy notes that this account "is recited in today's Muslim sermons, newspapers, and textbooks." Related Topics: History, Middle East patterns, US policy | Daniel Pipes receive the latest by email: subscribe to the free mef mailing list This text may be reposted or forwarded so long as it is presented as an integral whole with complete and accurate information provided about its author, date, place of publication, and original URL.